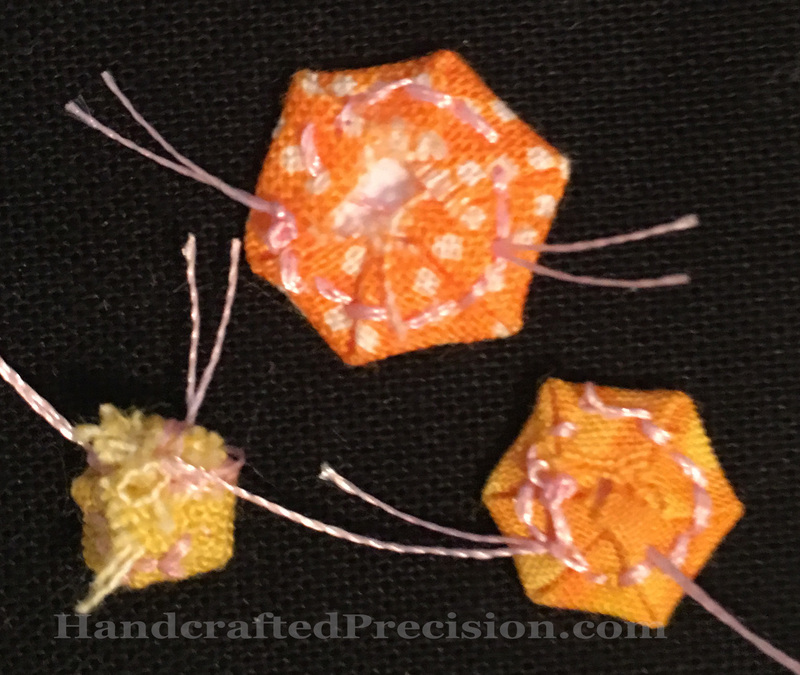 As I was working on sewing the minuscule hexagons together for the flowers, I realized that it wasn’t that much fun. The small needle was too small and it was easier with a longer needle, but still no fun. So I’m only going to make four flowers for the needle book. I don’t need flowers on the back cover or spine. They’ll be a feature for the front. 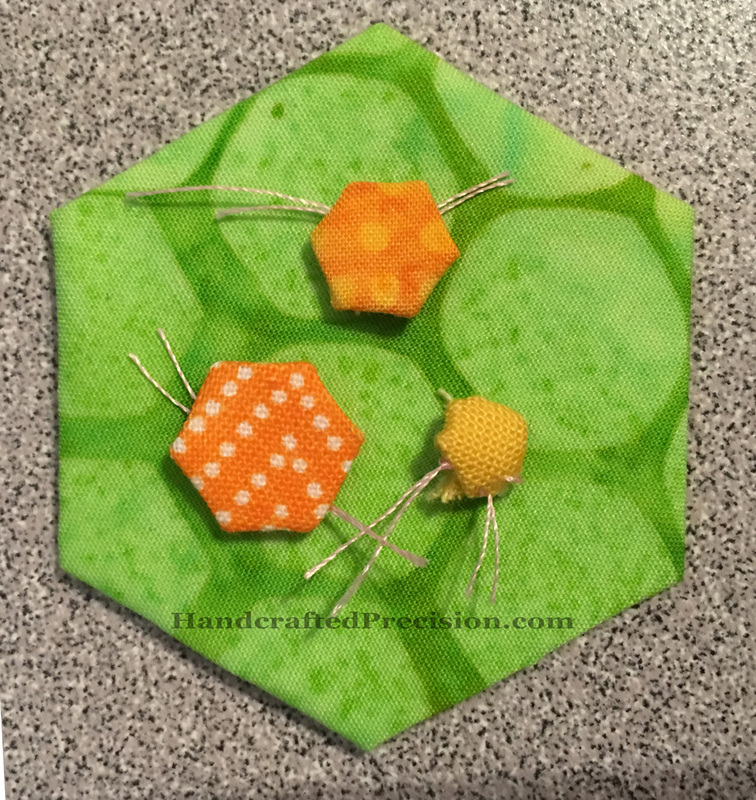 Here are the three I have done, and a few basted hexagons of the green path fabric. Only the orange flower left to go. 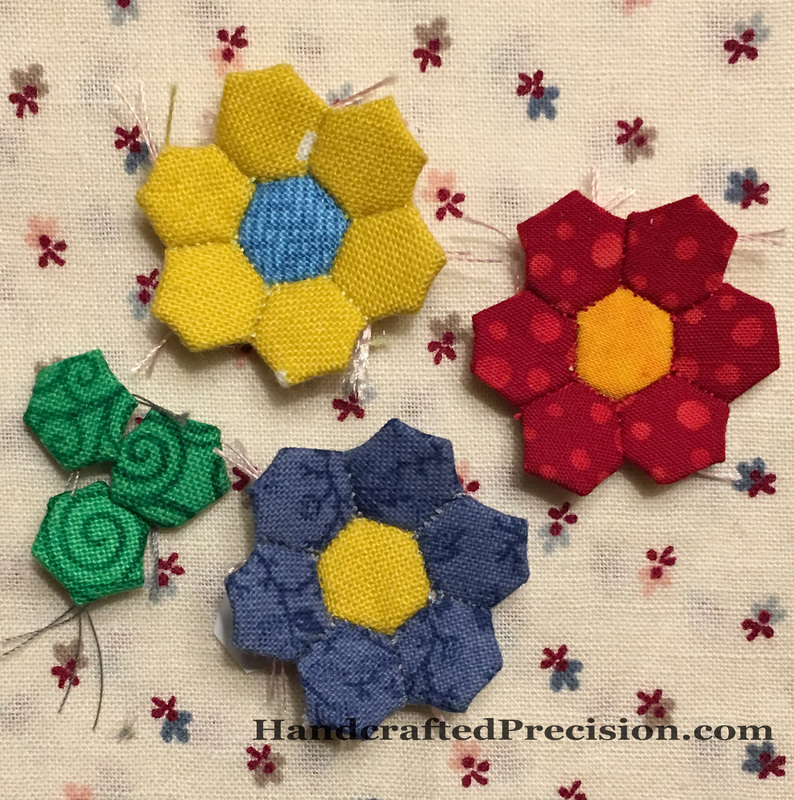 I was planning on a white/light hexagon with a fussy-cut motif for the center of the four flowers, but I’m not finding anything suitable in my stash. I thought the fabric I have them on above would work, but it’s not precise enough a motif. I’ll keep looking. I haven’t had time with the kids on Winter Break. Also, I see, especially in the photo, that the stitches are showing more than normal (and they’re about six on each edge, not seven). I hope the fabric will relax a little when I take the papers out, as I do plan on taking the papers out. This entry was posted in English Paper Piecing, Hand Sewing, Hexagons and tagged Minuscule Hexagons, Needle Book on January 2, 2017 by HP. 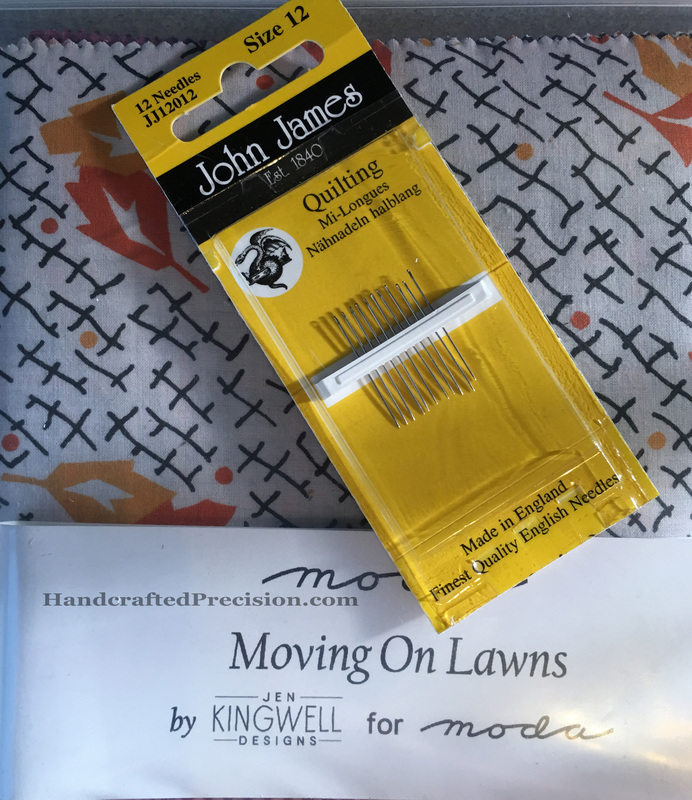 My local quilt shop, amazingly, had a charm pack (5″ squares) of cotton lawn fabric (Moving On Lawns by Jen Kingwell Designs for Moda). Apparently lawn quilts are a thing now, since they’re light and airy. 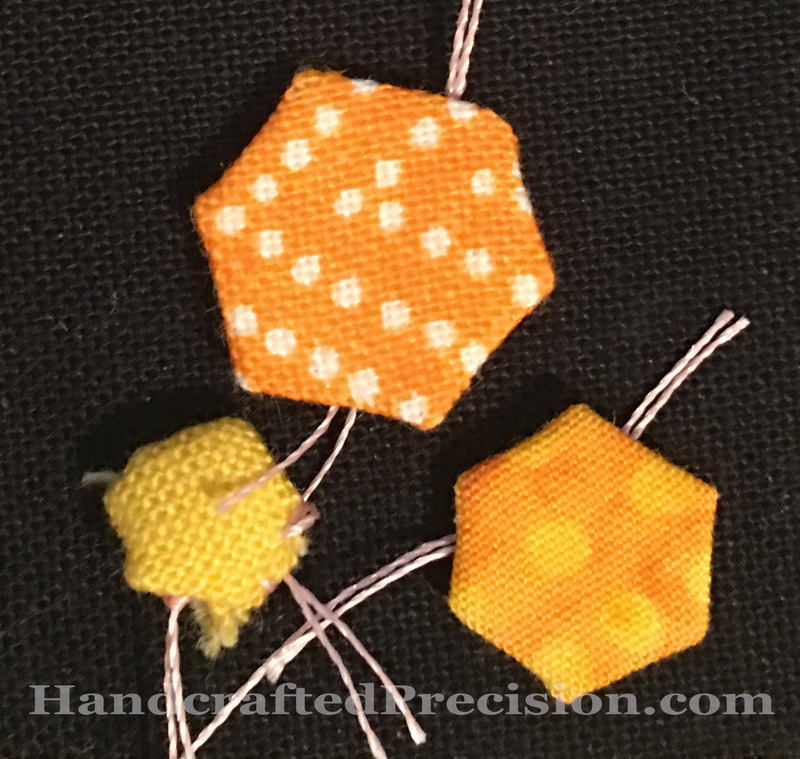 This charm pack’s fabric patterns weren’t the best for the 1/8″ or 3/16″ hexagons, but since it was just a trial for weight, it didn’t matter. I used a size 12 quilting needle and one strand of my usual 50 weight thread (the quilt shop didn’t have anything finer). I started on the pink one, and I think you can see what happened: though the fabric itself was easier to fold, the paper inside also folded as I was folding the TINY seam allowances around it. I was more careful on the blue one, but had the same problem. It was really hard to hold onto the tiny, tiny paper, too. Then I had the genius idea to use cardstock instead of the thick paper I’d been using. I cut a 1″ hexagon from Paper Pieces into the 1/8″ size. It was pretty silly. So much waste from a 1″ hexagon! Then I did the green one SUPER-carefully. It’s still not even, but it was the best I could do. Honestly, I could practice and get marginally better, but the paper’s never coming out of there and it’s never getting sewn into anything. It lays flat (the other two don’t) and looks mostly hexagonish, so I’m calling it a win. Remember that those sides are 1/8″ wide. So half of that is 1/16″ of an inch. If the fabric folding (or the paper hexagon) is off by a SLIVER, you get the unevenness of the green one. It’s way better than the ball of fabric I did for my very first one, so I’m satisfied. I think. I hope. 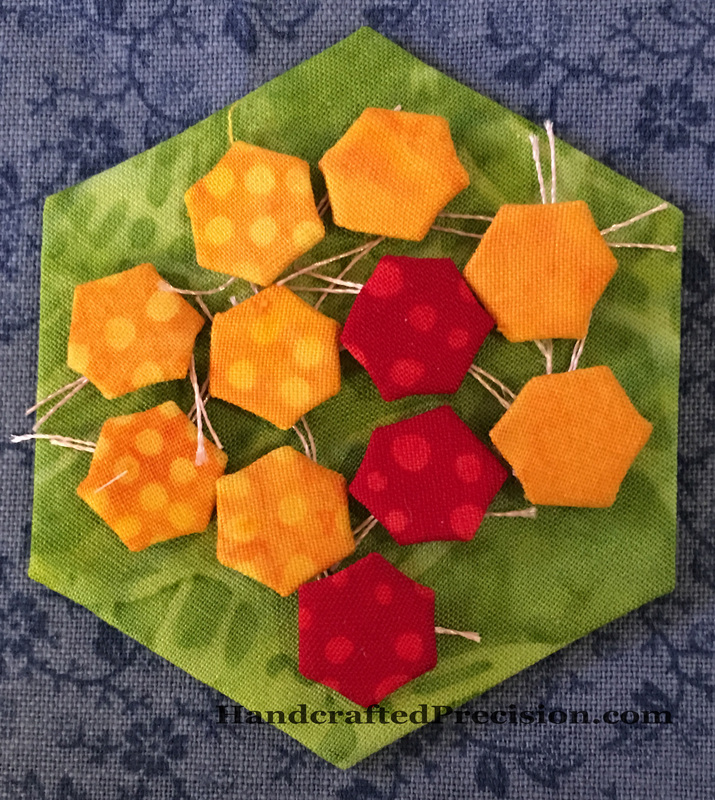 This entry was posted in English Paper Piecing, Hand Sewing, Hexagons and tagged Minuscule Hexagons on December 29, 2016 by HP. It’s pretty ridiculous and I’m not sure about ever getting those papers out, since the seam allowances are so small (about 1/8″, though I wasn’t very precise with my cutting). I’m afraid they’ll fray when I remove the copious basting and lever the papers out. I was only able to get about seven stitches along each edge, which I didn’t think was too bad. I did the math and that’s about 37(!) stitches to the inch. 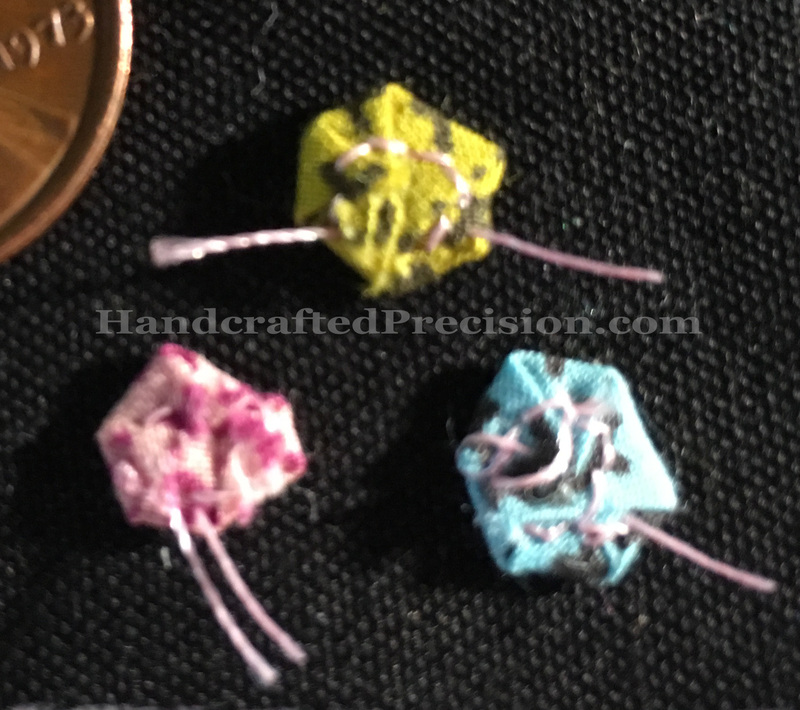 I’m pretty sure my stitching isn’t that dense on my 1″ hexagons, though I’ll have to check. Yay, I’m up to green on my as-yet unblogged rainbow hexagon diamond project. 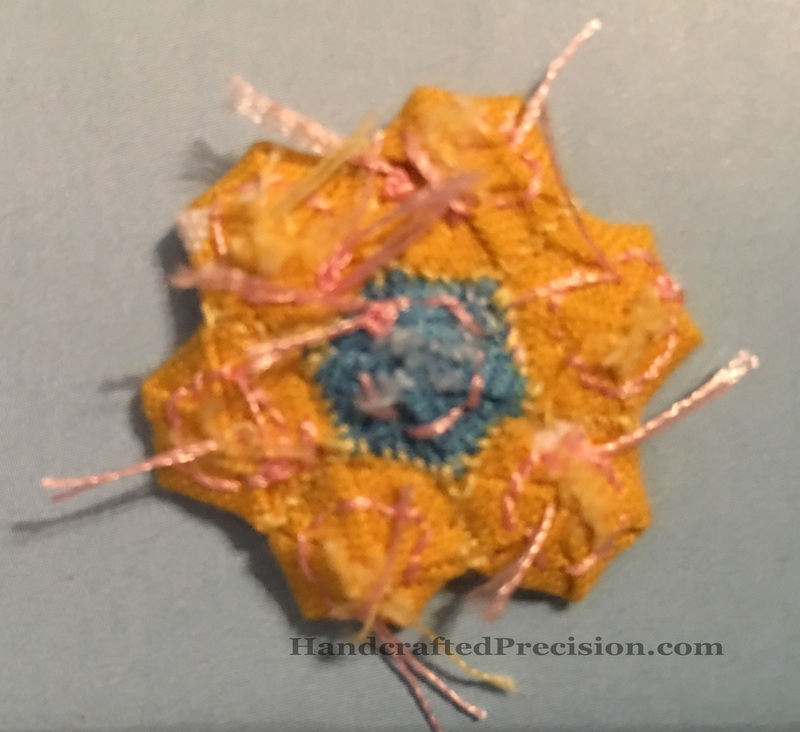 And here’s the flower on the 1″ hexagon. Pretty. But that 1/8″ hexagon is nagging me. It should be possible, and the 3/8″ hexes aren’t ridiculous enough. Now to see if my local quilt shop has finer needles (yes, I bet), finer thread (I hear Aurifil makes an 80 wt now), and some cotton lawn fabric (they have a small selection of apparel fabric, so maybe). This entry was posted in English Paper Piecing, Hand Sewing, Hexagons and tagged Minuscule Hexagons on December 28, 2016 by HP. 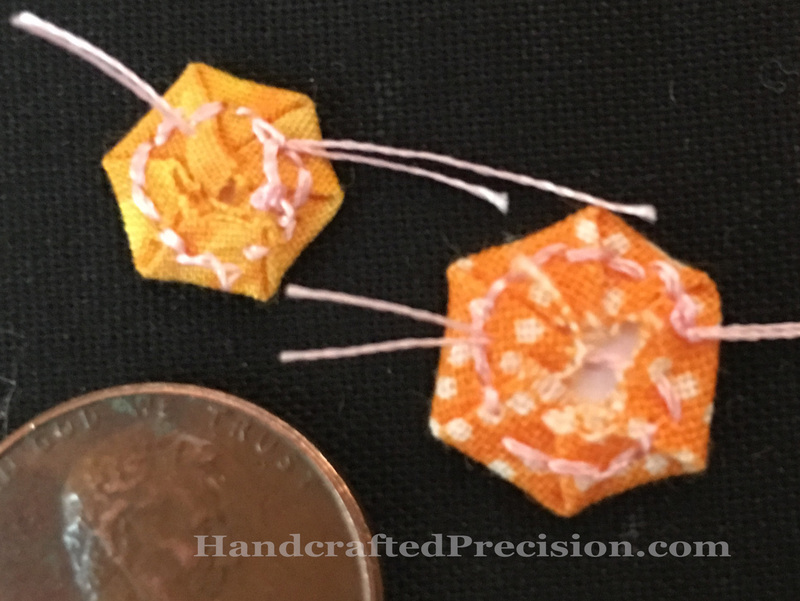 Well, it turns out that 1/8″ hexagons are ridiculously small, even with a finer needle. Regular quilting fabric is just too bulky and fray-prone for the necessary 1/8″ seams. I’d give it a shot again with a cotton lawn, but I don’t have any on hand or plans to acquire any soon. There’s likely a good measurement between 1/8″ and 3/16″ which yields a small hexagon, but not one that’s impossibly small. I’m not sure I care enough to figure out what it might be. The 3/16″ hexagons are growing on me, though. So cute and not really fiddly at all, with a little bit of practice. This entry was posted in English Paper Piecing, Hand Sewing, Hexagons and tagged Minuscule Hexagons on December 27, 2016 by HP. I follow a blogger (Karen at Quilts…etc) who does awesome handwork, EPP as well as applique and hand quilting, and posts daily (!). 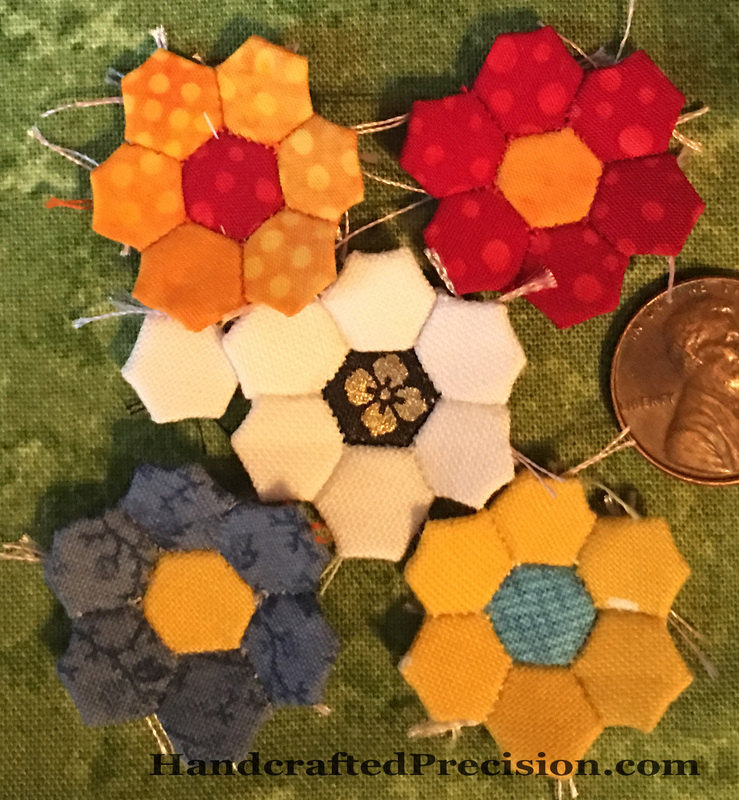 She recently started making “tiny” hexagon flowers with 1/2″ hexagons. She usually works with 1″ hexagons, so that’s a big step down. 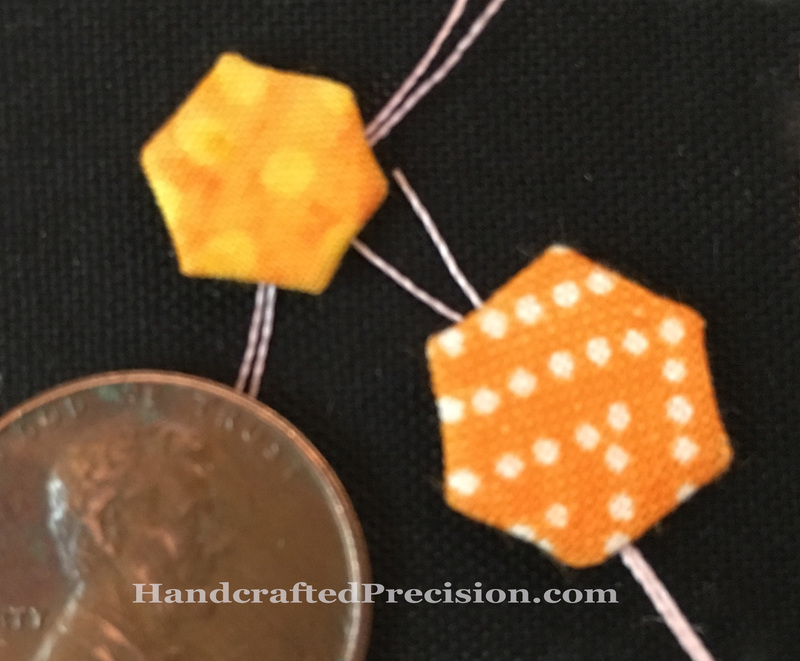 But since I started with 1/2″ hexagons and the project I’m working on has 1/4″ squares, which have less area than 1/4″ hexagons, hers don’t seem all that tiny to me. They were actually not as annoying to baste as you might imagine, though if I ever did it again, I’d use a slightly bigger seam allowance on both of them, and a MUCH finer needle. I might make a single flower of each for fun, to see how the sewing-together goes. 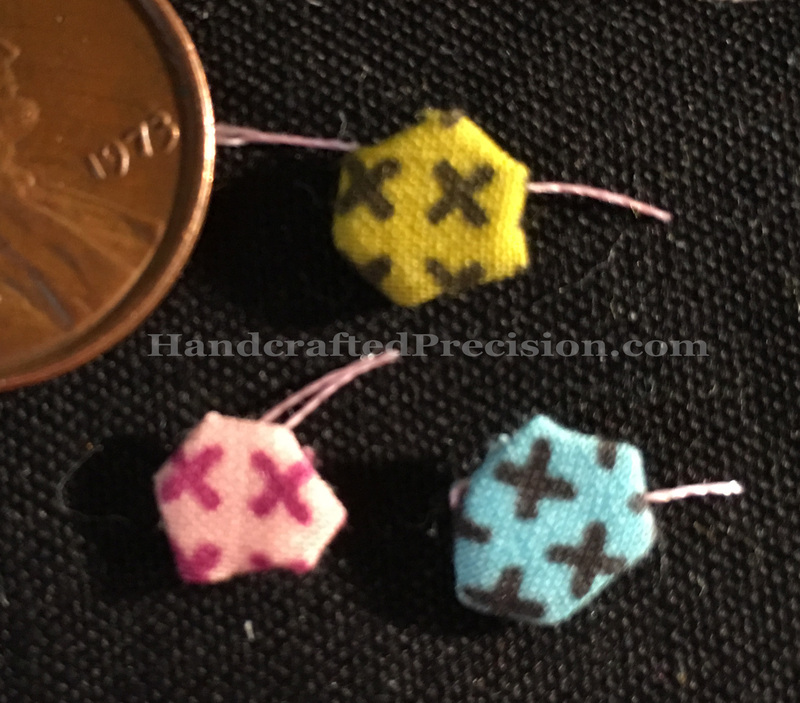 I was curious, so I did some math, and in dollhouse scale (1″:12″), the 3/16″ hexagons would equate to 2.25″ hexagons, which is a reasonable size for a quilt. The 1/4″ hexagons equate to 3″ hexagons in full scale. (That math was easier.) 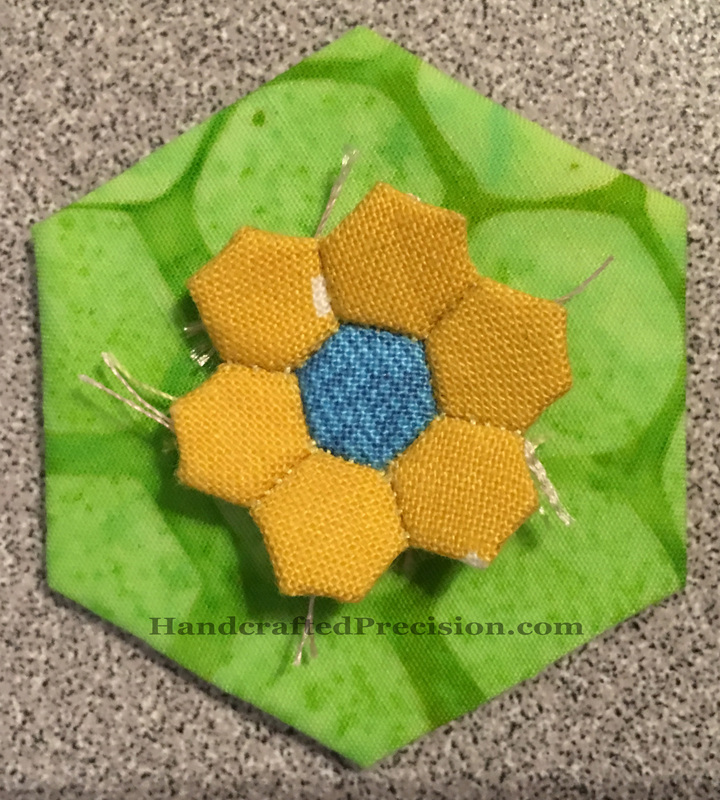 The 3″ hexagons are also still a reasonable size for a quilt showing off big chunks of large-print fabric. These sizes would make sense for jewelry, like a flower pendant. That would eliminate the problem of how to keep the work supple with such small seam allowances. Maybe using a very lightweight fusible interfacing on the back to lock in those seam allowances? I don’t have enough sewing experience to say for sure, but I think even that would destroy the drape at dollhouse scale. There might be a 3/16″ dollhouse grandmother’s flower garden (or just totally scrappy) quilt in my future. Way, way in my future. 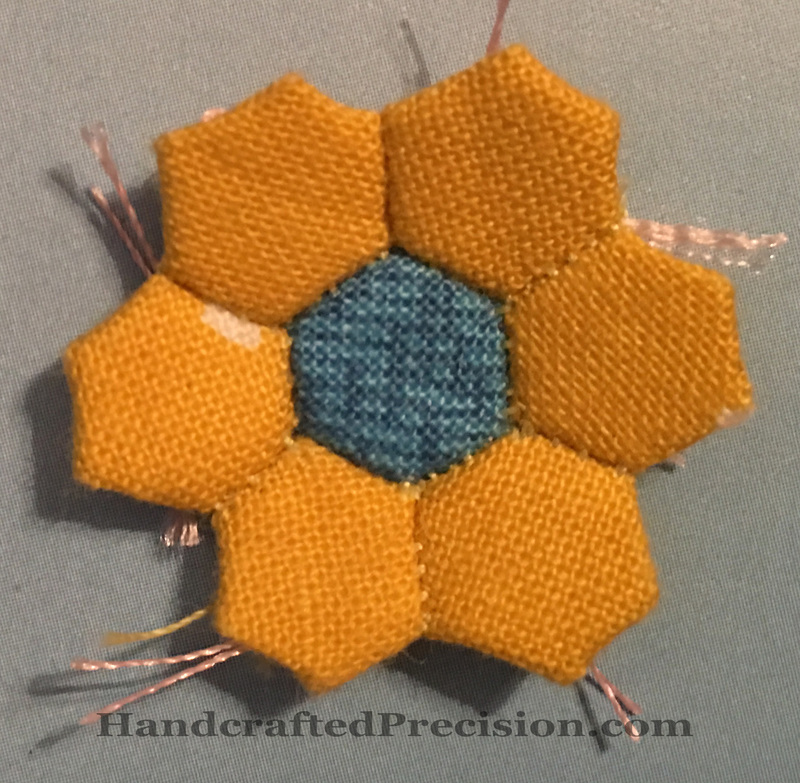 This entry was posted in English Paper Piecing, Hand Sewing, Hexagons and tagged Minuscule Hexagons on December 26, 2016 by HP.